Lynnwood site could be a light rail operations & maintenance facility, or a school district administration complex and bus barn. Bellevue station area planning begins. Seattle metropolitan area ranks 46th in pedestrian danger safety among 52 American metros. Alleged light rail copper thief before judge. 10 Metro facilities get new on-demand bike lockers. Vancouver BC to Portland on public transit. Tacoma planning evolution of the area south of downtown. Edmonds punts Point Edwards development back to the design board. Sound Transit rejects some recommendations from last year’s audit. Early chatter about using Sounder to get spectators to the 2015 U.S. Open in University Place. This webinar will use Seattle as a TOD case study. APTA suing to stop patent trolls that prey on transit agencies, including King County Metro. Federal Railroad Administration moving to relax expensive crashworthiness regulations, bringing costs and safety closer to European levels. Electric cars may not be any better (environmentally) than gasoline-powered ones. Portland considers a 3-hour transfer window. Is there any possibility that King County Metro will ever get back the $80,000 “protection money” they paid to the patent troll? A couple of days ago on a podcast, I heard an attorney who specializes in fighting patent trolls speak on that very subject, and she said no, companies that settle will never get their money back. The patent trolls aren’t stupid; they write the settlements in such a way that they don’t have to refund the money. Regardless there are others which I won’t name that would benefit from protection against trolls. To me that’s worth fighting. Sounder to the US Open is a great idea. It looks like there is even a small siding track right by the golf course. I would imagine that thousands of visitors would want to stay in a downtown hotel, and the train would be a perfect way to get there and back each day. Maybe two southbound runs in the morning, and two northbound in the evening? The problem, of course, is how much money will Sound Transit have to pay BNSF to get their ok? Answer – whatever the maximum amount is that Sound Transit is willing to pay – that is what BNSF will charge them. I think this is a documentary of BNSF’s pricing procedure. It would be wonderful if we could get our agencies to adopt the 3-hour transfer window for ORCA cards, and then get rid of paper transfers. That mitigates loss of the downtown RFA. Or else provide a cheap daypass, which does roughly the same thing. Why do we need a 3-hour transfer window? And yes, yes, yes on the day pass. But I don’t think you’ll have to do much to convince anyone who comments here on that one. You don’t have a montlhy pass, you come downtown to do business at city hall or king county, and now you want to go do some shopping. The 3 hour transfer lets you hop a bus or light rail without potentially paying a 3rd fare. A daypass serves the same need. We already have a 2-hour transfer window. Why does that need to be extended to 3 hours? Paper transfers essentially give you a 3 hour transfer window due to generous cutting and generous interpretation. We got rid of the ride free area, and you may have used up an hour before you ever get downtown. Monthly passes are priced based on 2 rides/day for 18 days. Give us a daypass at around 2 rides or extend the ORCA transfer window so that it’s similar to paper transfers and so you can do business around downtown. Do it only for ORCA and you can get rid of paper transfers. I don’t know how many folks use the website to manually add value to ORCA cards – I’ve never set up autoload because of the hurdles created if your credit card expiration date changes, or the number changes, or you don’t tap within 30 days. But the website for manually adding value to the ePurse has two features that in my opinion make it the single worst ecommerce experience that I have ever encountered. One is that it cannot remember a credit card for future use. Everywhere else saves my credit card for reuse, and clear the site can do that for autoload. The second is that instead of having a single field into which I can cut and paste my 16-digit CC number, it has four fields that are four characters wide. But that’s not all, once you enter four characters you can’t automatically enter the next four. You either have to tab to the next field or click the mouse. It’s such a flawed design. It should be less than an hour to fix the latter problem. Just frigging do it. Incorrect information on the site. Way to go Orca and Metro. Well I usually add epurse through the website and its usually available 2 mornings from when added. Sometimes ill get lucky and it will be available the next morning. If I wait until the 28th to add the pass ill usually just go to a ticket vending machine just to be safe (when added at a tvm or at customer service they are instantly loaded on the card and can be used immediately for epurse or at beginning of term for passes. Ooh. I already hate the fact that ST and Metro tracks my rides with Orca. It was a reason why I went and got a card anonymously from a machine and didn’t “register” it. Adding money online, in my opinion just links your name and info your card. Too much Big Brother in my opinion. You can track my card…but you don’t need all my info. I just hit a machine and use cash to add funds to my “eWallet.” The website admittedly seems a little clunky. If a website forgets your credit card number after a transaction, I’d consider that a feature. That can be your option. Virtually every ecommerce site in the world gives you the option to save a credit card number, and clearly ORCA saves it for autoload purposes. Why not have the option of saving it for manual reloads? I’ve seen websites with 4×4-digit credit card entry fields that automatically forward your cursor when you’re finished typing, but are so aggressive about doing so that they make it nearly impossible to correct errors in fields that are already full. You have to reload the page and re-enter the information. The ORCA site is better than that! Aside from the 24-48 hour delay, I actually don’t mind the ORCA site… mostly because it performs well enough on my phone that I can fairly easily recharge right from the bus if I notice my balance is low when I tap on. Compounding the forgotten CC # feature is the fact that you can’t add value to multiple cards in a single transaction. If they could fix this, I’d be a happier website user. Plus, it seems like they could avoid CC transaction fees if they implemented this. I’d like that feature too. It is weird in that they seem to implement a shopping cart, but not really. “Seattle metropolitan area ranks 46th in pedestrian safety among 52 American metros.” The news roundup headline sounds like bad news, but follow the link and you’ll see that the ranking is actually 46th out of 52 on the pedestrian danger index … which is good news. The top four cities are, not surprisingly, are in Florida. Not a list you want your city to be #1 on. I am not surprised that electric cars are no panacea. Look at the latest Tesla, which is a great car. While there is incremental benefit in the regenerative braking, you are still accelerating and moving around several tons of metal (or chemicals) for one person. And the electricity has to come from somewhere. Since we’re not building more hydropower plants, and wind isn’t really viable, chances are that the marginal generating capacity needed for electric cars is either generated by buring coal or natural gas, both of which emit green house gases. It’s still going to use less energy if people can walk, bike, or use transit. The problem I find with that article is that the author seems to assume that the batteries have no afterlife and that power plants cannot be regulated in any meaningful sense. EV batteries, after they are degraded past the point of working a car, can be applied to different uses. Coal and nuclear plants waste huge amounts of electricity overnight maintaining spinning reserve (they can’t be shut down or even throttled back to any real extent) so if you are charging a car overnight, you are at east making the plant more efficient and the coal plant’s CO2 emissions more “meaningful” (for want of a better word). Also, if coal plants had more stringent emission standards put in place, isn’t it better to have a handful of stringently regulated smokestacks rather than a million unregulated tailpipes? I think the author is totally discounting the enviromental costs associated with the increasingly complex ways we are obtaining petroleum products. And I find that assessment of the enviro costs of solar panel production to be extremely fishy. Once a panel is produced, it generates electricity for decades with *no* environmental costs. Last but not least, who says wind is not viable? I agree that it doesn’t work in places like Seattle, but the wind generation across the country is robust – and the modeling work that agencies like BPA have developed are making it much easier for system operators and much better for grid stability. EV’s are not *the* answer. Nothing is *the* answer. The answer is a million things – Better communities, better transit, more efficient power production, etc. There are two reasons why I saw wind isn’t viable. The first is because the wind is so intermittent that you need to maintain spare capacity or a huge storage system – that relegates wind to a small role at best. The second is that the amounts of land mass (or shallow sea) that would be needed to generate any meaningful amount of electricity. The structures occupy a lot of land area and cannot be too close to each other. They are also a hazard to birds. I simply don’t see wind being a substantial component of the electrical supply. Also, I did not say that gas powered vehicles are environmentally superior – but rather than the EV doesn’t suddenly make private vehicles environmentally friendly. They still require a lot of energy, and roads, and parking. Walking, biking and transit are much friendler. Even if you imagine a perfectly-efficient car, with 100% of its power coming from renewable sources, the fact is that it still takes more energy to transport a 4000-pound vehicle than to transport a 150-pound person, and a car with a 200-square-foot footprint takes more space (both roads and parking) than a person with a 5-square-foot footprint. No amount of energy innovation can change that. I’m not defending cars – I’m just questioning that article. And that’s not correct about wind energy. Utilities and ISO’s are making great strides in both integrating renewables and storage. The bigger problem is transmission capacity. “Great strides” these days means going from 1% renewable energy to 1.1%. There’s still a high percentage of hydro in the electricity generation mix. And the switch from incandescent light bulbs to LEDs is actually freeing up a large amount of already-produced electricity. Now, of course cars are less environmentally sound than vehicles with lots and lots of people in them, like buses or trains. But *within the category of cars*, electric cars are *much* more environmentally sound than gasoline cars. *Even if the electric cars are powered by coal*, which they usually aren’t, they have a smaller carbon footprint. The batteries are *already* recycled. For reference: in practice, the marginal electricity generation for Teslas is generated by solar. Why? The sort of environmentally conscious rich people who are most likely to buy Teslas generally simultaneously put solar panels on their house. And Tesla actually offers to set up appointments for Tesla buyers with Elon Musk’s other company which installs solar panels (yeah, kind of obvious that). As shown in Figure 7-7, and in contrast to the damages analysis above, the operation of the vehicle is in most cases a substantial relative contributor to total life-cycle GHG emissions. That is not the case, however, with either the grid-dependent technologies (for example, electric or grid-dependent hybrid) or the hydrogen fuel-cell vehicles. In the latter vehicle technologies, the dominant contributor to life-cycle GHG emissions is electricity generation and the production of hydrogen rather than vehicle operation. Well then…produce the hydrogen with wind or solar and the problem is solved, because they just admitted the problem is not in the actual operation of the vehicle, but in the generation of fuel. And a further argument for going to fuel cell electrics (I exclude battery cars, because they’re just silly and almost all manufacturers are eschewing them in favor of fuel cells), is that even if the GHG are equivalent, you can more easily sequester them if you produce the hydrogen in a remote centralized facility near a solar cell plant or wind farm. The idea is that by creating the hydrogen vehicle (and here I include buses and trains), you can go in two steps. The first step is moving pollution out of the populated areas by not burning fossil fuels in cities or suburbs. The second step is removing Carbon from the fuel cycle entirely through clean generation. So, there really isn’t an argument against fuel cell electric transportation (personal and mass transit) here. So cutting out all the scientific mumbo-jumbo, what does this mean for you? Well, it would seem researchers have made a big step toward legitimizing hydrogen as a petroleum-based fuel replacement. It seems no fuel is perfect but hydrogen is getting mighty close. The thing is, if you’re producing your power using solar (which directly generates electricity), or wind (which directly generates electricity), why the heck do you want to convert it to hydrogen (which is really horrible and difficult to store safely) and then burn the hydrogen (an energy-lossy conversion)? I mean, I suppose if you’re in an area with no electric grid it might make sense. But in a country where everything is electrified? Why not just use electricity? How bizarre is it that the only way to get from Olympia to Centralia by public transit is provided by Grays Harbor Transit? Thursday, July 4: SEATTLE TROLLEY TOUR Enjoy an unhurried 4-hour tour of city’s unique trolley bus system. Our restored trackless trolley buses will take you from Seattle’s hectic downtown to several fine old neighborhoods throughout the city. Tour stops for photos and lunch. Trackless trolleys depart at 11 a.m. I managed to see them go by on the 44’s wire in Wallingford yesterday. It was a fun ride. Things ended up running faster than planned, so they took an extra jaunt down the 7 and 14’s wire to Mount Baker TC before ending at Main and 2nd. …which is where the problem started. Somewhere after leaving Mount Baker, a small engine fire started in the back of 643. By the time the coach got to Jackson, it was filling with smoke and people noticed. The driver let everyone off at 5th and Jackson, extinguished the fire, and called for a wrecker. Looking at the damage afterwards, it looks pretty minor, but given the age of the coach I’d be worried about finding repair parts. Hopefully the damage isn’t that significant. Can somebody tell me why Sound Transit is tunneling through the hill between East Main Station and Bellevue Station? Why is the alignment even curving west at all, when the next station up is ending up on the same street as the previous station? Bellevue Station is on NE 6 street and 112 AVE NE. Why didn’t ST just keep East Link going north, straight up 112 AVE NE, and save however many tens of millions of dollars it costs to tunnel through that hill? I’ll tell you why. I believe that Sound Transit wants to make their projects unnecessarily complicated, expensive and big (tunneling through Queen Anne hill when they should go around it), as a way of increasing and solidifying their size and power. It’s called ratchet creep. Sound Transit initially proposed a surface alignment on 108th Ave NE. It was Bellevue that wanted a tunnel instead, and is paying some of the cost. Frankly, the current station location is a terrible compromise. It’s not centrally located in the downtown catchment area, and because of the wasteland created by I-405, about 40% of the station’s catchment area is empty. The station should have been located closer to the intersection of the 108th & NE 6th – it would have been closer to virtually all residential and commercial centers in Bellevue. Given that overall cost of East Link, and that downtown Bellevue is the second largest center in the region, it’s a very short-sighted decision to save some money with the extremely poor location of the station. The train has to somehow turn from north to east. If the train were going up 112th, by the time it turned east, the nearest spot after the turn would be Overlake Hospital station. 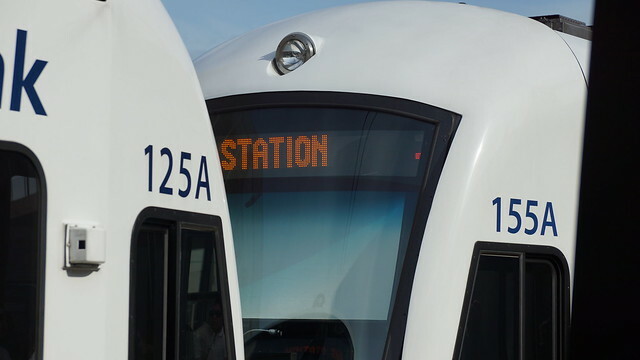 The light rail system, Dallas Area Rapid Transit (DART), is to be doubled in size during the next decade following agreement on a $2.4bn investment programme. The year 2006 marked the tenth anniversary of the opening of the first 17.6km (11 mile) line with 14 stations, which has since grown to 77km (48 miles) with 39 stations overall. Rail, light rail and bus operator DART was formed in 1983. DART light rail was instigated in the mid-1990s, as a forward-thinking project associated with a major redevelopment of Dallas. It is reaping the rewards of its major investment, having grown from carrying 1.4 million passengers in 1996 to 17.5 million in 2005. DART has become one of the largest light rail systems in the US, after Los Angeles, Newark, New Jersey, San Diego and Portland MAX. I never thought I’d see so many positive comparisons to Dallas County and DART. It’s a pity that DART’s light rail is so awesome in comparison to their abysmal bus service. I still enjoyed using DART; at least their drivers don’t believe in going from 35MPH to a dead stop in fewer than 10 feet at a bus sign. It seems like a city like Dallas was able to fund the expansion of its light rail without the reactionary naysayer opposition we get in our “progressive” city, or was there formidable opposition? New York City MTA will replace hybrid bus enginges with diesel ones, non-hybrid, I believe. Hasn’t Metro been totally disappointed by the lack of fuel savings from our hybrid fleet? It doesn’t justify the capital and maintenance cost. And NYC will have virtually all stop-and-go driving. Umm, no, Metro has saved money with hybrids. I believe the whole full-size bus fleet will be all hybrid or trolleybus soon. Sound Transit has found them to not be worth the additional cost, but their typical duty cycle is totally different. that hybrid city buses work best with “intense stop-and-go routes where the average speed is 8 miles per hour.” In situations where buses travel longer distances at higher speeds, the hybrid system is less useful because the lithium ion battery harvests power from when the vehicle brakes and when the bus is coasting. Hybrid systems are terrible because they are battery systems and batteries are incredibly heavy. For example the curb weight of a tiny Prius is more than my KIA because of the 700 pound batteries! Hybrids have to have multiple power systems, a large battery, a diesel generator and an electric traction motor. This is different from a hydrogen system which consists of the fuel (h2), the lightweight fuel cell and the electric motor. You are not carrying around hundreds of pounds of batteries or an added diesel engine to run an electric bus. John, you’re exaggerating as usual. The weight of a Prius’s battery is around 100 pounds, and the electric motors add maybe 100 pounds more. The Prius is not that tiny — it’s a midsize car, albeit a well-packaged one. In the context of an articulated transit bus that weighs 25,000 pounds empty, the battery weight is negligible. The energy savings from reducing the usage of the diesel engine in its least optimal situation — starting from a dead stop — far outweighs the energy required to carry the battery around. I must have read that in a blog that exaggerated things. Still hybrids have two systems, whereas hydrogen buses (and diesels) have one. The weight of the Prius battery varies according to the source. Assume the heaviest weight, of 176 pounds, or 88 kilograms. And, according to: http://toyotapriusbattery.com/repair.html, the replacement cost for the Prius battery is about $4000. For some buyers, having a high curb weight isn’t a disadvantage for a hybrid car, but for anyone concerned with performance it can quickly become an issue. Gasoline / electric drivetrains usually tip the scales heavier than their gas-only counterparts, due to the fact that an electric motor, battery pack, regenerative braking system, and associated cooling systems are all part and parcel of the hybrid design. Battery packs especially can add significant weight to an automobile, which is why they are mounted as low as possible in order to preserve the vehicle’s center of gravity. Unfortunately the more performance a hybrid car offers, the larger its battery pack, which means that increasing output to deal with additional mass of takes a weight toll of its own. NYC is replacing about a quarter of hybrid buses, whose warranties are coming up, with diesels. They’ll continue to use the hybrids on the most congested routes, FWIW. No, Metro has done well with the hybrids. Not only do they save fuel, but they also save in maintenance costs because there is no conventional transmission (just a fixed planetary gearset) and they treat the engine and the service brakes so much more gently. A few years ago when I was touring North Base, I heard this. Moderately better fuel economy, less/easier maintenance, and also a bit more power up the hills. The hybrid diesels are also appreciably quieter, both inside and outside the coach. The planetary gears are actually a complicated point of failure. I think the future of “diesel buses” is going to be like diesel railroad engines. Diesel railroad engines have a diesel generator hooked by a purely electric transmission to electric motors. There are very few moving parts, and the electric motors last forever. Nathanael, Boston bought dual-mode buses in 2005 for the Silver Line that run like locomotives when in diesel mode. Perhaps they aren’t well optimized, but they get worse fuel economy than current diesel-electric hybrids, and manage to be heavier despite the lack of batteries. The planetary gearsets in current diesel-electric hybrids are rather like a conventional automatic transmission except without most of the clutches and other moving parts. They can fail, but they do so less often and less expensively than conventional automatic transmissions. Boston did absolutely nothing right with the “Silver Lie”, and I wouldn’t use it as an example for anything. I would just assume they ordered inferior-grade, poorly designed buses. Of course, the planetary gearset is better than an automatic transmission. I still consider it an interim development. Series hybrids with electric transmission are going to take over pretty quickly. And then everyone will switch to pure electric. I will be at any and all Point Edwards develpment meetings I can get to staunchly opposed to it. The only access to Pt. Edwards is via the roads I use daily. The 304 and 301 are pretty healthy from Richmond Beach. David L keeps saying that Metro tried extending 301’s hours from Shoreline, but always neglected to say WHEN that experiment took place. …or even if it was well advertised which Metro does a horrible job of doing if service hours are being expanded. The NE 145th Street interchange is in high demand from traffic from the Northlake and Shoreline in the morning because it doesn’t have a southbound ramp meter. The southbound on ramp at NE 175th already backs up onto the arterial. Where will most of Pt Edwards people work? Seattle…Redmond…Boeing (Everett/Seattle). Pt. Edwards is a horrible location and should be abandoned. Aside from being along BNSF/Sounder North, will users really ride transit from here? It was quite some years ago… I don’t remember exactly when, but before I left the Seattle area in 2005. The thing is that, Point Edwards aside, there has been very little change in population or land use in any of the 301’s catchment area. There has been a significant increase in 358 ridership, but that’s mainly driven by increased density around Bitter Lake. There’s no reason to think the results of any 301 expansion (excellent ridership peak-hour and peak-direction, horrendous ridership off-peak and counter-peak) would be different today. In any case, this will all be moot in a decade or so when there is a 185th Link station. Expand the frequency of the 348 to 15 minutes all day, extend it to the county line on the Richmond Beach end (if Point Edwards happens), and transit access for those areas will be dramatically better than it is now. This experiment occured before Katrina slammed NoLa and sent gas prices where they are today; bar a blip of relief in 2009. Well, of course there would be no ridership off-peak. Why would anyone ride the bus if driving was cheap…parking was cheap…etc. Let’s fast forward six years. Parking is becoming more and more of a commodity as surface lots and decks make way for towers and new developments. …and if you do drive, be prepared to shell out nearly double what you did in 2005 for gas. I remember paying $2.29/gal back in the South. The 301’s last bus hits I-5 at about 9am…and it is more often full by the time it departs 175th and Midvale. Extending Southbound service by 1.5 hours will allow the 301 to make use of the I-5 Express Lanes until they close at 11am. At that point, sounthbound I-5 congestion builds rendering the ride on the 301 via I-5 slower than the 358 on Aurora. There would be no point running a 301 after 11am. Travel times would be too variable and unreliable. Likewise, another bus could be sent North an hour earlier than the current earliest afternoon bus when the EL are Northbound. The bus would depart Pike at 2pm. I think that’s right. I’m sure a couple of extra shoulder trips would do just fine. I was under the impression you were arguing for all-day bidirectional 301 service. Point Edwards is not Point Wells. Though some of the same issues are at play in both places. My mistake. Darn name rolls of the same so similarly, when you have a southern drawl. …but looking at Point Edwards. They are plopping the development at the base of a hill that has some rather pricey single family homes plopped on generous parcels. I highly doubt those folks are going to go down without a fight. Plus, who in their right mind is going to put that kind of development immediately next to a slough and marsh? Reminds me of going to Olympia and the smell of Budd Inlet fills the city when the tide is out. Yuck! Yeah, some similar issues to Point Wells, on a much smaller scale of course. In the sort of community that’s in both places today everyone up there wants to live at the end of the cul-de-sac. In order to build the sort of strong community where more of people’s daily needs can be met locally some sort of building will be needed, but I really doubt Point Edwards is that. Even the much more ambitious Point Wells plan won’t do that by itself because its location is so bad, but might create an opportunity for more comprehensive local businesses and services in the Richmond Beach area generally. We forgot one more news article this week! The appointment of a new US Secretary of Transportation. I don’t like to post articles from sources outside of Charlotte. I’m finally glad to see my old home getting some deserved recognition. It’s The end of car culture says the New York Times as under-35s don’t rush to get a driver’s license, and are less concerned about what kinds of cars their peers have. The Seattle Times sees a 10% drop in driving among local young adults since 2008, a 5% increase in transit use, and a 13% increase in walking. Hey Ford, how about building trolleybuses and streetcars. Car companies like Ford could one day become big innovators in the automated taxi business. The company that primarily owns Chrysler, FIAT (*snicker*), makes all sorts of goodies. They make IVECO commercial vehicles…including buses and trolleybuses! Both IVECO and Irisbus are owned by FIAT! Unfortunately, they are all made overseas, so they would be in violation of that “Buy America” B.S. Ironically, you can find them in the US, just hop on the BRT on the Las Vegas Strip. You’ll find yourself on the Irisbus (IVECO) Civis. My next door neighbor’s oldest boy just turned sixteen, and he has no plans to get a license. His father is (rightly I think) going to make him learn how to drive, but he’s relieved he doesn’t have to worry about him driving socially. My driving experience was similar: my parents forced me to get a license, gave me a car to use. Growing up where I did (Dayton, OH), it was kinda required to drive 20 minutes to do anything, but as soon as I moved to Seattle I sold my car and haven’t looked back. Plenty of my peers are the same. Car2Go is owned by Daimler-AG, and seems to be quite successful around here. Car companies are not entirely stupid or short-sighted. They too can read the gas prices and can tell that driving will become an increasingly expensive, luxury commodity. And a rural thing. Driving is going to remain necessary in most rural areas. Unfortunately, this means that the rural poor are going to get hit *yet again*, and they’ve been getting the worst of every economic trend for something like 150 years. True, but the proportion of the population living in rural areas has been declining for a full century now. And automation could one day make bus service or car sharing feasible in semi-rural areas (especially along a major highway between large urban areas) where it is not feasible today. On the electric cars article. I’m not saying the funding automatically negates the results but it should cause us all to take a closer look at every level and step of the study. Both the studies cited in the article are wildly dishonest and fall apart as soon as you begin to investigate them. Yes, here in reality (as opposed to oil-company-land) electric cars are better environmentally than gasoline cars. They’re still worse environmentally than riding the diesel-powered bus, though. Sounds like they need to read Shoup’s book. Notice posted at Link OMF when I signed in for work today indicates elevated track inspection on July 6 and 7 requiring single track operation and 25 minute service most of both days. I wonder if the Tukwila Sounder station design is final? From the pics online, it looks like there still will be only one path to get from one side of the platform to the other. I’m no engineer and it looks like it would be a pretty good amount of work but a crossover tunnel at the south end would be nice. Especially since Amtrak occasionally shows up on the “wrong” side. There’s supposed to be a second path, but it’s associated with lowering some road below the grade of the railroad, which is a separate and independently (un)funded project. That streetsblog entry cited discredited oil company sources. Yes, electric cars are better environmentally than gasoline powered cars. Period. The so-called “studies” which claim otherwise are completely dishonest. Electric cars are still worse than taking the bus, environmentally, of course. I imagine a city without a central dense core or downtown…all suburbs. In that instance, more highways should drain the neighborhood streets of long commutes. It’s the focusing problem of having too many jobs in a downtown designed for 18th century horse and buggies and cobblestones.